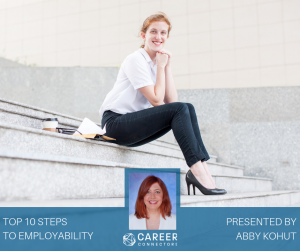 Abby Kohut is on a mission to help one million job seekers land their next great career opportunity. Yes, one million job seekers. “I was put on this earth to help people,” said Abby. Our keynote speaker has been featured on NBC, ABC, CBS, SiriusXM, Bloomberg Radio, Monster and The Ladders among many other traditional and social media outlets. To say the least, Abby absolutely knows her stuff. Abby’s been driving and flying all across America for several years delivering on her goal. For the captivated Career Connectors audience, she shared the absolute truth about the job search process that other recruiters simply won’t tell you. How many pages should your resume be? One? Two? Five? There is no resume police or resume law enforcement. There’s also no resume data on what’s right or wrong. Ask 20 experts and you’ll get 20 different opinions. The proper length is whatever works for you. Research the players – Finding the interview players on LinkedIn does not make you a stalker. It will help you find common ground (or common connections) and help you build rapport. Prepare your “why” – Why THIS company? Why THIS position? Search deep down. Make your answers specific to the employer. Include the whys in your cover letter (Tip: always submit a well-written cover letter). Prepare SAR’s – Be ready for the Situation Action Result interview questions. Reflect back on your work history and memorize your stories in great detail. Expect to be asked about your past mistakes and a time you didn’t get along with a co-worker. Important – never complain about ANYTHING or ANYONE, unless only your pets can hear you! Even if you mention the insufferable Arizona summer heat you may be perceived as grumpy. Don’t do grumpy. Important – NO typos. Be certain your resume and cover letter are completely error free. Get proofreading assistance. This is from an actual resume: Reason for leaving my last job – took time off to renovate my horse. Set goals that you can reach. For example, two networking events and five job applications per week are attainable goals. Keep your job “funnel” full. Leave your house, meet people and network. Apply if you’re at least 65% qualified. The other 35% will be based on your culture fit. Please – no pets or family members in your LinkedIn profile picture. Avoid the mug shot and the selfie-on-the-mountain. Use a professional, face-forward photo with a nice smile (Career Connectors resource). People have landed great jobs because they’ve listed a personal interest or hobby on their resume (Abby is an example). Again, there’s no police. Including personal interests on your resume is up to you. Refresh your resume every Sunday on the job boards. This gives the appearance that you are a fresh prospect. Recruiters are searching for new candidates on Monday mornings. Had enough of corporate America? Tired of the daily grind? Become a coach or a consultant or an author. That thing you do for fun and are truly passionate about…could you earn money doing it for others? Avoid the mindset that “everything stinks.” Despite an unexpected career transition, there’s plenty to be pleased with in your life. You have a home, electricity, air conditioning, a car, a family, etc. Be grateful. Start a Top 10 list of people or things that please you. Read it every night. There is a job out there for you. And when you land it, you’ll understand why this career transition may be the best thing that’s ever happened to you. November and December are fabulous months for job seekers as hiring companies get revved up for the new year. BE employable! When Freedom Financial was founded in 2002, the primary mission was to help people overcome debt and enjoy financial freedom. Today, Freedom Financial provides solutions for debt settlement, mortgage shopping, personal loans and more. Freedom has been voted as the #1 Place to Work in Phoenix two years in a row! The State Farm mission is to help people manage the risks of everyday life, recover from the unexpected, and realize their dreams. Join a community of good neighbors! Benefits include paid time off, Health & Welfare, Financial Planning & Retirement, Work life & Well-being. The Woz U mission is to bring opportunities in I/T to the masses, provide a quality education and launch each student into a career in the technology field. The next Career Connectors event is scheduled for Thursday, November 1st in Glendale. The event will feature a panel discussion with experts from the healthcare field. If you’re even remotely interested in a career within or supporting the healthcare industry, register today. Jessica thanked our wonderful team of volunteers and gave a big shout out to our host facility, The Central Christian Church in Gilbert. 07/12/18 – YOU are the Differentiator! Connie Kadansky works with sales people worldwide in a very specific niche of prospecting, self-promotion, and overcoming internal and external obstacles. She says she has a coffee cup that reads, “Get your ‘ask’ in gear!” That’s appropriate because her presentation was about asking for what you want. She learned at a young age to ask for what she wanted, and years later, when she was interviewing, she asked the manager for the job. She got the job, because he told her later that she was the only one who asked for it. She started off her presentation by waving a twenty dollar bill in the air and asking, “Who will give me $1 for this $20?” After a few seconds, two gentlemen raced to the front of the room. The first guy didn’t have $1, but the second guy had his dollar ready, gave it to Connie, and she gave him her twenty. It wasn’t a joke. He just made a $19 return for going to the front of the room and asking for her twenty. Connie says that offer was available to everyone in the room, yet only two people tried for it. That’s the secret – you need to ask for what you want. 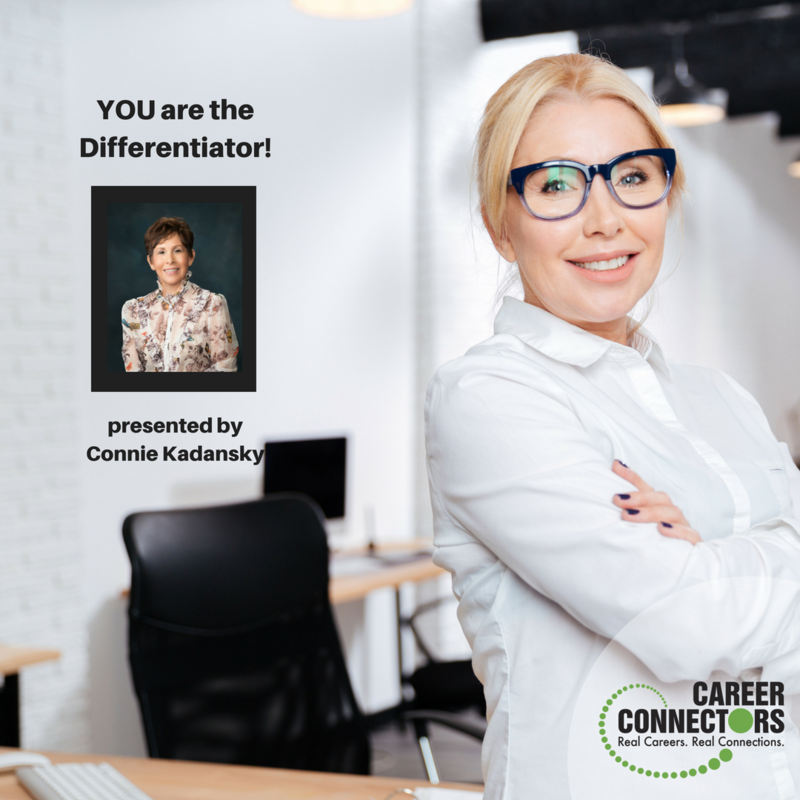 If self-promotion is the missing ingredient in your job search, read more of Connie’s thoughts on how to self-promote and be the differentiator. Everyone agreed that the “Yes, but” responses zap the energy of the first person. It’s difficult to defend their suggestion when they hear several negative responses starting with the words, “Yes, but…” The “Yes, and…” is not necessarily agreeing to go, but is more receptive and responds positively to the offer. There is uncertainty when we job search. Sales call reluctance is the emotional hesitation to self-promote. It’s a fear of rejection. Instead, take proactive steps to make phone calls to the people who can influence your ability to earn what you are worth. Connie suggested putting jars in opposite corners of your desk. On Monday morning, one jar is filled with the number of coins, gems, or marbles that equals the number of calls you will make in the week. For every call, move one of the coins to the other jar. If there are still a number of coins in the first jar on Friday morning, you know you need to make more calls before you start your weekend. You need a consistent pipeline of possibilities to get the job you want, so overcome your reluctance, make those calls and ask for what you want. Curiosity is also helpful in the job search process. While skepticism and curiosity are both questioning mindsets, curiosity turns doubt into fuel for learning and discovery. Be sure to ask curious questions in your interview. Connie even says that you can get away with almost anything when you start by saying, “I’m curious.” Curiosity is the secret ingredient that makes your job search an adventure. Positioning – Utilize your existing networks and look for ways to develop new ones. Make sure you get noticed. Participate so others notice you. Style – Possess something distinctive so people will remember you. Do people want to remember you? Is your style serving you? Consistency – Never leave self-promotion up to chance. Know that self-promotion is important and do it repeatedly. SHOW UP! Opportunities are out there everywhere. Connect with the right person with the right attitude, and ask for what you want. Confidence is faith and trust in yourself and your process. It transforms fear into focused thinking and action. We all have our own internal conversations, so discipline and monitor those thoughts to banish the “Yes, but…” response, and use the “Yes, and…” reply instead. Don’t forget that self-promotion is a key ingredient in your job search. Become noticed by the hiring managers, and you will be the differentiator. Launched in 2002 by Stanford Classmates, Bradford Stroh and Andrew Housser, Freedom Financial provides financial solutions, services, and education, enabling consumers to resolve their debt and achieve financial freedom. They were voted the #1 Best Place to Work in Phoenix two years in a row. Their offices are located near the 202 and the 101, just east of Tempe Marketplace. They have 2,100 employees and growing. Freedom Financial takes their core values seriously, including helping their own employees who may have found themselves in debt through the Freedom Family Fund. Employees pay to wear jeans to work, the CEOs match and double these contributions, and the money is then used to help employees get out of financial trouble. Freedom Financial is currently hiring for Call Center/Sales/Operations, IT/Engineering, and Analytics, Product/HR roles. A complete list of open positions is on their website. Also, follow Freedom Financial on Facebook, Twitter, LinkedIn and Instagram. State Farm is located in Marina Heights on Rio Salado, across from the ASU football field. They have 8,000 employees locally and more than 70,000 across the organization. Molly is currently hiring operations positions, including claims and customer service roles. Go to State Farm Careers for the current list of openings. State Farm offers information sessions by invitation- contact her if you’d like an invite! In the job market today, 58% of all new jobs are in STEM, and computing jobs are the #1 source of new wages in the United States. To help you get the necessary skills to compete in this job market, GCU offers an Immersive Java Bootcamp. In 16 weeks, the bootcamp offers more than 600 hours of project-based collaborative instruction and your accelerated path to employment. The courses completed within the bootcamp are part of GCU’s existing, regionally accredited programs. These courses are transferable to a GCU bachelor’s program, or eligible for transfer at the discretion of other regionally accredited U.S. institutions. At our next event on Thursday, July 19, Jackie Schierenberg will discuss “Expert Tips on How to Navigate the ATS” at our Scottsdale location. Check the schedule online for more upcoming topics. A few dates of our summer events have been moved to accommodate summer programs at our host locations, so be sure to confirm the location as well. Bingo! It seems Robbins could just as well have been talking about job transition when he speaks of self awareness versus limits and evaluations. “Being aware of your own patterns” could very likely have referred right back to DISC assessments. Our keynote speaker addressed this very topic of Self Awareness when she spoke to us about the vital role of DISC. And more good news? DISC is valuable in more ways than our work life. While we’re learning about ourselves and our strengths through DISC, we can take away valuable information for dealing with people with different behavioral styles whether at home or at work. Or that in between time of job change or career transition. She never really thought of herself as a tool or gadget person. Instead, Lauren Kutsko describes herself as a collector of behavior assessment tools. She’s a certified behavioral analyst who loves helping people gain insights into themselves and others. She finds clarity of self a powerful tool in not only the job search, but in every area of our lives. As keynote speaker, Lauren shared what makes DISC one of the important tools of self-assessment for finding clarity and getting in touch with our key strengths. Along the way it can help us adapt in many of life’s challenges, including meeting potential employers. The DISC assessment is a key part of the work she and her husband do in their own business, The Entrepreneur’s Source. Her strong message today is to pick a career that honors our strength. Many specific turning points in our lives allow us to pivot and chart a course including “partnering up” or going off to college. Career transition is one of those opportunities in life to pivot and find our strength, so she urges us not to miss the opportunity. In recognizing our own strengths, we can begin to more quickly recognize the style of whoever we meet on that career path. DISC. What do the initials represent and what’s it all about? First of all, DISC is the universal language of observable human behavior. It’s a language of HOW you do what you do. A person’s behavioral style is NOT what makes them good or bad, right or wrong. It’s a neutral language. DISC assessment seeks to identify your behavioral style–but also to understand and appreciate people who have different styles–and then to develop a process to communicate with the different styles more effectively. The DISC assesses our style and we’re all pretty much a mix of the four traits. But one trait usually dominates. If we’re too far “off” our dominant strength, in our work life (and we all can adapt), after awhile it stresses us. And eventually, we’re not very happy. During the keynote, Lauren took the audience through some examples to see if we could recognize someone’s dominate style. For example, if someone rates high on the Steady trait but with a secondary strength in Influence, that person might find teaching or HR work satisfying because those careers draw on those strengths of steadiness and people skills. 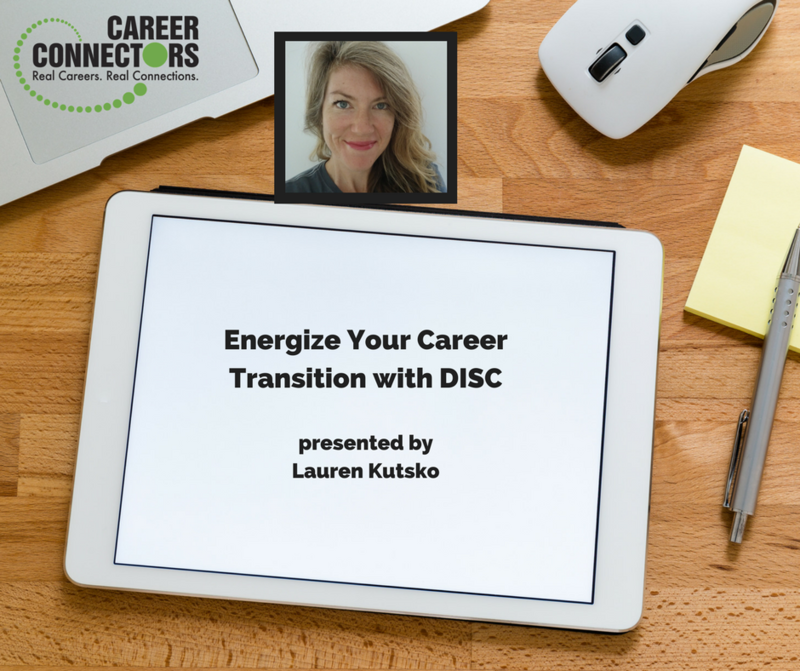 The more you analyze DISC, the more you can know your own strengths. But the more you analyze DISC, the more it reveals about personal styles in people we meet, allowing us to adapt, but more importantly, to understand other styles people possess as we navigate the world. One of the most interesting things in the presentation today, to me, was addressing the pace at which someone walks–in identifying their style! As you become familiar with your own strengths via the DISC assessment, you’ll be able to quickly determine the personality of people you encounter in life and in your career search. Notice how the person is dressed. How are their papers displayed? What’s their stance or posture? Slouched or straight posture? Does the person seem steady? Are they warm? Do they engage in small talk first or get right to the point? How are they using their hands when they talk? Are they talking about people or tasks? What emotions do they hint at? How are their emails written? Paying attention to these clues could potentially help you size up your interviewer in about three minutes, Lauren suggests! So besides helping you focus on your own main strengths, the DISC assessment could likely help you identify other people’s styles. And that could come in handy at work or at home. Or in that important interview. Cox Communications, a broadband communications and entertainment company, commits itself to technology, the community they serve and a diverse workforce that encourages personal development and team building. Cox prides itself on their core values that include dedication to relationships with customers and employees. The company vows to do things right, employ a diverse workforce, remain people-focused, be a leader in the industry, and be dedicated to the community and employees. In return for their dedication to employees, Cox expects their employees to be team players who make individual contributions, who continue to learn, and to try innovative and new ways of doing business. Cox currently has many open positions including Media Sales Specialist, Sales Associate, Home Technician, Technology Supervisor, Local Sales Manager, Commercial Security Consultant and more. Go online to create your own job profile and find jobs in your field. To learn more about current openings and to apply, visit their website. Manpower, a national and worldwide organization with over 70 years of experience, focuses on industrial and office/clerical positions, with emphasis on youth, women, people with disabilities, veterans, seniors and the long-term unemployed. The company has been named one of the world’s most ethical companies 2012 through 2017. Some contract staffing companies offer no contract benefits, but Manpower offers medical/dental with eligibility after the first paycheck; short term disability; holidays after working over 1800 hours in the previous 52 weeks; 401K eligibility after first paycheck; shopping discounts; Manpower Recognition Program; and IT, business skills, and personal development training. Current open positions include customer service agents, document processors, data entry, production/warehouse, packing/kitting/general labor, seasonal shipping/packing and sorting with a major shipping company, and administrative/clerical roles. To apply visit their website, create an account, and attach your resume. Then after registering, contact their office at 480-824-7976. State Farm Mutual Automobile Insurance Company is the parent company of several affiliates and subsidiaries that provide property and life insurance, banking products, and mutual funds. State Farm’s mission is to help people manage the risks of everyday life, recover from the unexpected, and realize their dreams. The benefit of its being a mutual company is their primary focus remains its policyholders. Their beautiful local corporate offices are housed near Tempe Town Lake. Employees are very important to State Farm who offers competitive pay, time off, health and welfare, financial and retirement planning, training and development, and work life and well-being benefits. Current positions include accounting, financial and banking; administrative support; claims and investigation; customer service; facilities management and administrative services; legal, compliance and risk management; human resources; marketing, design and communications; research and analytics; sales support; technology and user experience; and underwriting and actuarial. To apply and see the current list of positions, visit their website. Jessica Pierce, Executive Director of Career Connectors, closed the event with the same enthusiasm she opened with, calling attention to the wonderful facility provided by Highlands Church. Highlands continues its Highlands HOPE Initiative, which offers gift cards to attendees who qualify financially and who are in a job hunt or job transition. 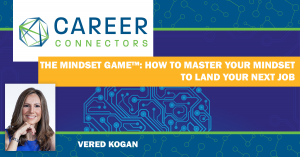 The DISC assessment can be taken free of charge for Career Connectors’ attendees. 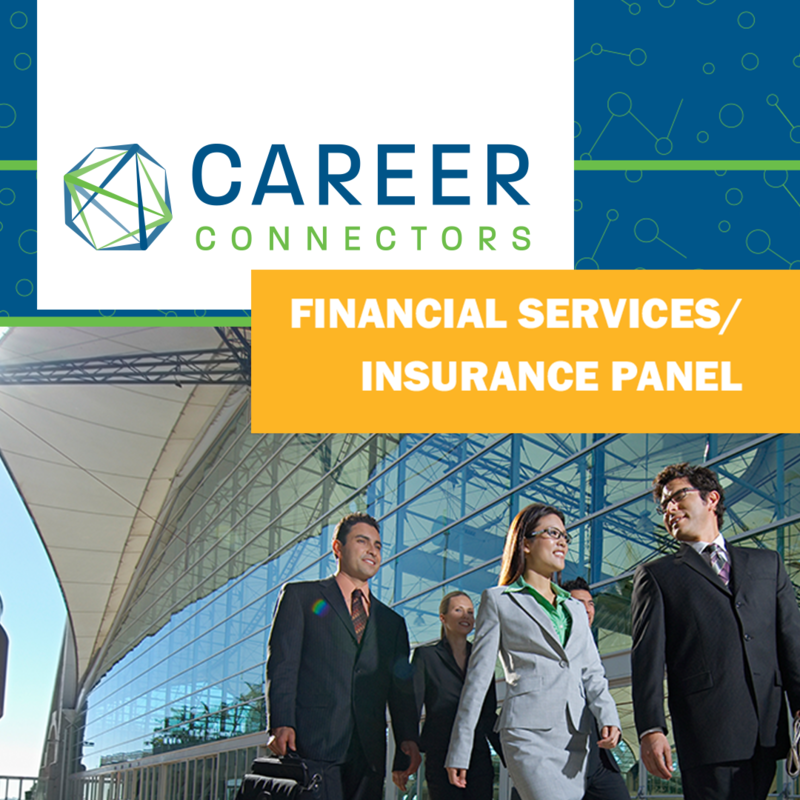 Career Connectors also offers an event recap blog and a career advice blog. Those in attendance can meet one on one with hiring companies, experts in LinkedIn, finances, resume writing, and with a professional photographer to have professional photos taken for LinkedIn. For information on upcoming events throughout the Valley, see the links on this page or click here to check specific locations, times and agendas.